It’s a challenging workout, but you’ll love it. I didn’t know how much I yearned to fly. Until I could. I thought the bungee workout would be a variation on TRX, with stretchy cords instead of straps. 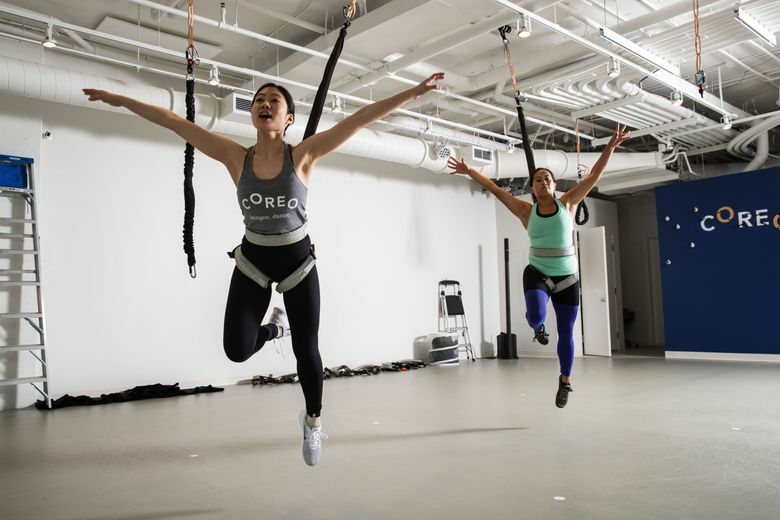 When I arrived at Coreo Fitness in Queen Anne, I was thrilled to learn I had underestimated the bungee workout on every level. 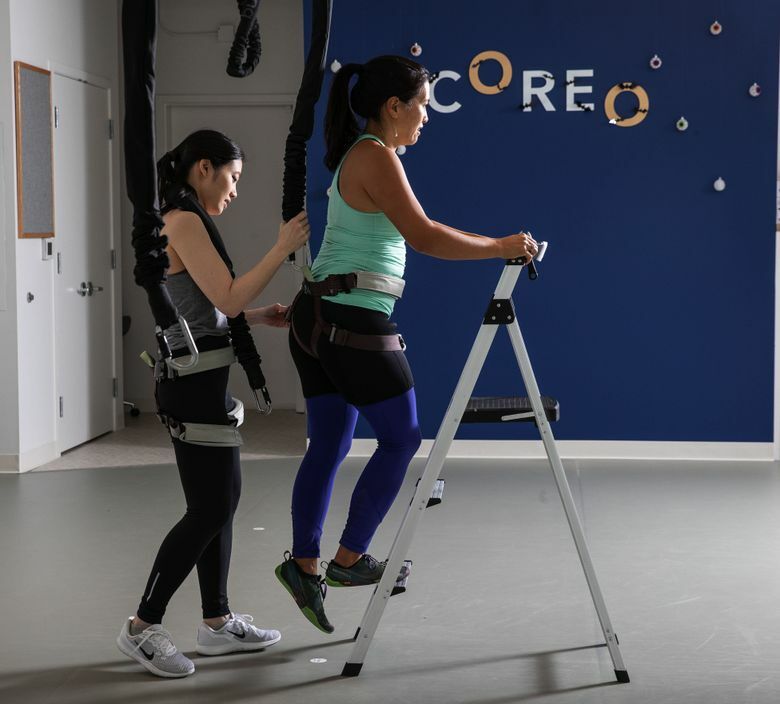 Coreo is the first studio on the West Coast to offer a bungee workout, and has beginner classes to help you learn it. Our teacher, Stephanie, explained we would be learning moves on the bungee, and put our steps together at the end of class in a choreographed dance. 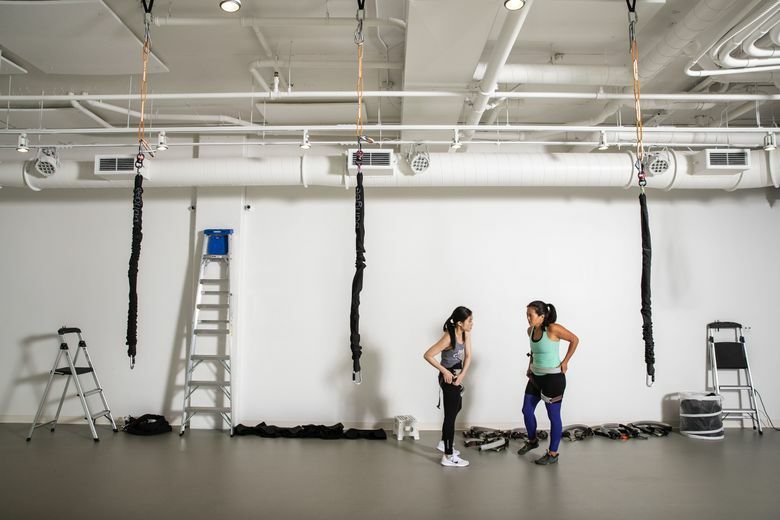 The workout is based on circus arts; if you’ve seen Cirque du Soleil, you might have seen a bungee cord in action. After our warmup, we put on a pair of thick neoprene shorts and the harness, and the teachers hooked us up to the bungees. Stephanie showed us how to step forward and backward to lunges. There was a lot of resistance in the lunges, and she told us to keep our knees soft. Lunging alone required a lot of strength. I had to get used to the bungee’s resistance and adjust to it. Then, she showed us how to take a flying step up instead of a lunge. I was astonished and mesmerized by her balletic leap into the air, and couldn’t wait to try. We practiced jumping with both feet first, diving on a diagonal line toward a mirror on the wall. The more you angle your body, the stronger the jump, Stephanie said. Jumping off two feet was exhilarating; the more power I put into it, the longer I hovered. I soon was out of breath, and couldn’t stop practicing. We jumped off one foot, which was slightly more complex and even more enticing. Sometimes, I didn’t float very high, and stumbled back to the ground. Studio owner Tiffany Kung told me to take longer steps to help myself fly even higher. I did it, a smile plastered on my face. With multiple reminders to land softly with bent knees, Stephanie encouraged us to lift a knee and reach our arms into the air like Tinkerbell. But we had more to learn. Our next dance steps included squats, sitting low to the ground; staying on the balls of our feet; and spinning in quarter, half and full turns. Sitting into the harness was easy, but the move was deceptively hard, requiring us to keep our feet light as we circled. It required a lot of core. I struggled to control the landing after whipping around for the full turn. Stephanie had us do a few more side lunges, then taught us our last move: the chandelier. We wrapped one arm around the bungee cord; circled one leg out and into a circle; and spun, dangling from the cord. It was fun, and the easiest move we learned. Finally, we were ready for full choreography to our song, “High and Low” by Empire of the Sun. It included plenty of running and leaping. Even though we did regular lunges instead of leaping ones, Stephanie couldn’t stop us from forgetting and leaping into the air, anyway. We all laughed every time someone did it. Flying is irresistible. My legs burned during the squat circles, and I loved the mini break during chandelier. We ended with more running and leaping. By then, all of us were sweating and breathing heavily; it’s an intense workout. Nicole Tsong teaches yoga at studios around Seattle. Learn more or reach her at nicoletsong.com. Dean Rutz is a Seattle Times staff photographer.